G is for Growing Pains. It is so easy to get caught up in the academics and the extra-curriculars with high school. Test scores, credits, all of that stuff you need on transcripts. 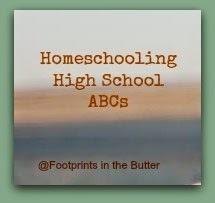 I think that one of the biggest advantages to homeschooling high school, though, has to do with growing. Whenever my boys are going through a growth spurt, they seem to sleep for 20 hours a day (and either eat or snap at each other for the other four)! I'll drag them out of bed to do school, but it is like every synapse in their body is focused on getting them too tall for the jeans I just bought, and there is not a single spark left to run their thinker. I've learned to back off, expect less, and let them get a bunch of sleep. We couldn't do that if they were in school. I'm accused of being too soft on them, and I'm told they will never learn to "just do it" in the real world. But it isn't like I let them get out of everything. After a week of lots of sleep, along with taking a day to go buy jeans that are 2" longer, we can get back to chemistry, or calculus. I like to think they'll get more out of it that way. I'm pretty sure I'm right for my kids anyway. My next post might be H is for Honors or H is for History or maybe H is for How Can I Possibly be a Mom of a High Schooler? ... or maybe, like the past couple weeks, I'll be writing one post and another will force itself out. Marcy is posting a word study, and this week is G is for Gentleness. There are a few dozen other amazing G posts linked up too. Go check some out! That is my boys too! They can sleep for so hard and so long... and I'm also accused of being soft on them. But hey - whatever works. And letting them get extra sleep does seem to work! I love how matter of fact you are about handling this! I need to relax and let my boy sleep in when he feels he needs to instead of watching the clock and getting irritated! Getting to the point of being matter of fact about it has been a bit of a journey.